Now this is a social media meme that I in NO way shape or form believe to be true. It however does make me think. WHY when a mother does something for herself is she judged for it even when her family is well taken care of? We never see these things said about men. If a man golfs weekly. 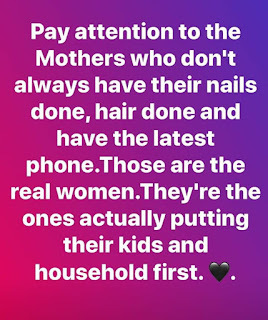 No one is accusing him of neglecting his family or home BUT me getting my nails done every 2 weeks is looked down upon. The cost of his golfing is MUCH more than my nails. Men get hair cuts. 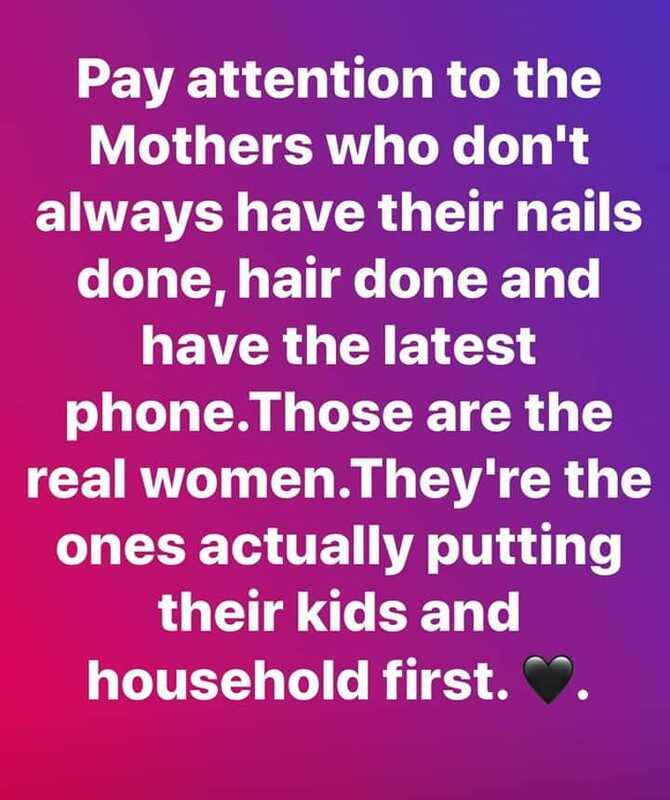 No one is telling them they are neglecting their families for such acts of self maintenance. Why? Why is it only women who get judged? WHY is most of the judging coming from other women? Women and can equally be good or bad parents. The way one looks and the phone you use isn't a sure fire way to say yes he or she is a bad or good parent. A friend said " Because women who can't afford to get their nails done all the time are jealous of those who can. That's all it is." Is this really true? Is it all jealousy? Have I just been lucky enough to have a core group of friends who are my biggest cheerleaders? The types of ladies who say things like "pretty nails" and actually mean it. Not pretty nails now I am going to put you down to everyone? I just find it so odd. Why can't we cheer each other on or just mind our own business? Welcome to my little slice of internet heaven. My name is Inza. I'm a 34 year old single mom. Toddler music class...YES it's a thing!! !